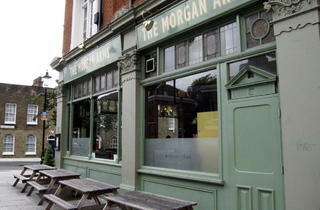 There's more than a hint of the gastropub about this busy Bow boozer, with Sunday roasts proving particularly popular. The pub dates back to the late nineteenth century, and while there are a fair few aesthetic nods to its past, the modern artwork, covered al fresco decking and recent lick of paint keep things contemporary. Although much of the produce is sourced locally, the food menu takes its lead from a variety of cuisines. Expect, therefore, Italian charcuterie boards and coq au vin alongside Thai beef salads, pork bellies with anise and carrot purée, pumpkin and ricotta ravioli and 12oz rib-eye steaks. The wine list focuses on the old world, with wines from Spain, France, Italy and Portugal dominating. There are a few organic options, too. Beer comes from five hand-pulls, with drops from London Fields Brewery, Truman's and Hackney Brewery alongside the odd guest. Bottled options include Brooklyn, Anchor Steam and plenty from local brewers, Redchurch. Great bar, great food, amazing atmosphere but unfortunately the service was terrible both in the restaurant and then when we complained about the terrible service. However a new manager has taken over in the last few weeks so hopefully there will be a lot of improvement. Really chuffed this is now my local. Great space, with an exciting beer selection and friendly staff. Definitely recommend the pub quiz! The environment is amazing, good music and good food. Lovely atmosphere, pleasant food and so close to home! Definitely 5/5. No questions about it. Best thing are their Sunday roasts. I can't tell if it's the atmosphere, the staff, or the surroundings, but i can never leave here after 'just 1 pint'. Great pub, the quizmaster is hilarious (and you can win a cheeseboard if he likes your joke!) and the steak is delicious. Plenty of cute dogs to coo over, good drinks selection and friendly staff. A great local bar to go and meet friends and enjoy a delicious selection of food and drinks. It can get very busy and hard to move in there at times but that is just a sign of its popularity. Haven't had a bad experience so far! Sometimes a picture says it all. Here's roast beef from the Morgan Arms, hands down my favourite Sunday roast in London. Just look at it! If that's not enough for you, the staff here go above and beyond to make sure you have everything you need for an outstanding Sunday slap-up feast. Brilliant Sunday roast, very friendly staff! A home away from home - A great pub with fantastic staff and delicious food! Great pub, brilliant atmosphere, wonderful food. We are particularly fond of their Sunday lunch. The best pub in the East End - amazing food, brilliant selection of real ales and fabulous staff. What more could you want? Awesome bar, food and staff! Great beer, wine, cocktails, food and staff. Love this home from home. 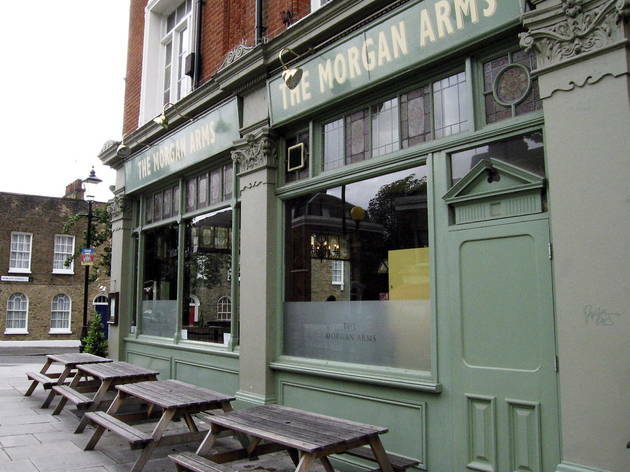 I read the previous reviews and realised they were, all in all, historic in terms of The Morgan Arms as it is now (2010/11 isn't exactly recent). I have no experience of the place in 2010/11, as the first time I ate there was around July 2011, but I can't concur with the previous reviewers' comments on service. I can only imagine they have taken the comments on board with great success. If you want to eat in the bar area you're more than welcome to and the restaurant area is great if you want to be away from people who are just drinking (hardly in a rowdy way, it has to be said). The food has been continually very, very good gastropub - which is exactly what you'd expect for a £15 lunch, anything less would be a disappointment. It's still on the high end of price, but you're guaranteed decent food, thoughtful service and a great pint of well-kept ale. This is only seconded by the fact that I've been there on a Sunday and found it packed to the rafters. That says it all. I went to this pub a few weeks ago for the first time and thought it was really brilliant. It's such a friendly and relaxing place with great decor. The food was really tasty and very reasonable. Make sure you make room for a dessert they are truly special! There is also a wide selection of drinks. I am moving to London in a few weeks and I will definitely be returning! Thanks! Just googled this pub to send to a friend and found all these terrible reviews. Well, all I have to say is that I thoroughly disagree and not sure what pub these people were at but I've always had a lovely time (been 3-4 times over the years). Most recently, I enjoyed a lovely dinner with three of my closest girlfriends at the weekend - we had booked a table and got one of the best in the house! The service was great and the waiter made a great recommendation on the day's special which I thoroughly enjoyed. The wine list is superb and pairs well with an inspired menu. Looking forward to my next visit!